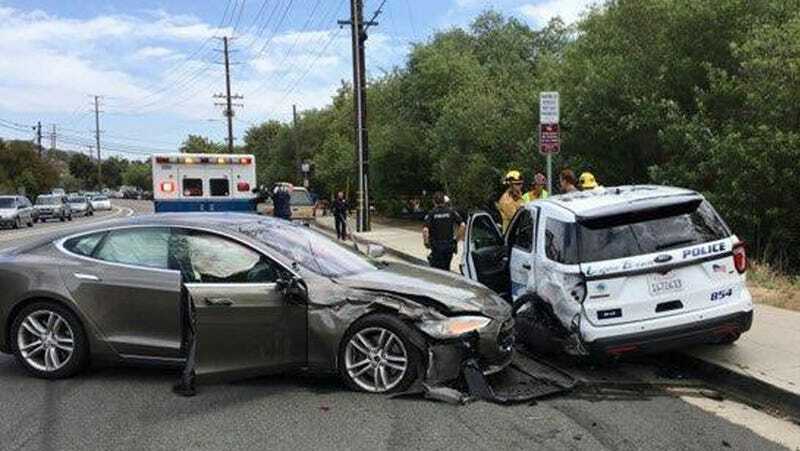 The scene of the accident involving a Tesla vehicle running in autopilot mode in Laguna Beach, California on May 29th, 2018. [Police Sgt. Jim Cota] said the luxury electric car crashed in almost the same place as another Tesla about a year ago. The driver, he said, also pointed to the Autopilot system as being engaged. The crash comes as Tesla has been facing scrutiny involving Autopilot. Since March, a driver died when his Model X SUV crossed the center divider in Mountain View, Calif., while in Autopilot mode. And another driver in Salt Lake City was injured in a crash when her car hit a parked fire truck. In both cases, Tesla says it can tell from its logs that drivers were either distracted or ignored the car’s warnings to take control. In April, Bloomberg reported that safety advocates were becoming increasingly skeptical of Tesla’s claims that autopilot mode reduced crashes by 40 percent, saying the company was misrepresenting National Highway Traffic Safety Administration data that itself was not fully released to the public. By May, the NHTSA was publicly distancing itself from Tesla’s use of the statistic. Another study by the Insurance Institute for Highway Safety found a much lower reduction of 13 percent, though spokesman Russ Rader told Bloomberg they could not attribute that to any specific feature of a Tesla vehicle. CEO Elon Musk recently committed to regularly releasing safety data on autopilot, per the Verge. Though engineers say that self-driving cars are likely going to be safer than human-piloted ones—humans are in the aggregate very unsafe drivers—there’s something about either the concept or the companies developing them that seems to send up red flags in the minds of the public. A recent AAA study found that 73 percent of respondents didn’t trust the cars in April 2018, following a string of accidents involving Tesla autopilot as well a lethal accident in March involving a self-driving Uber vehicle.